Tencent’s US$180 million investment in Nubank the Brazilian financial services company propelled the latter’s valuation to $4 billion, making it one of the highest valued unicorns in Latin America as well as in global emerging markets. The fact that, Nubank just raised in February a $150 million round led by DST, means there is no lack of funding. As the company’s co-founder David Velez says, they “found so much value in partnering with Tencent, particularly everything there is to learn about the Chinese financial market.” More here. Tencent is apparently picking up its global investment steam under the financial services theme, in Southeast Asia, it just co-invested in Filipino mobile wallet Voyager. More here. Grab received an undisclosed amount of strategic investment from Microsoft in a deal that similar to the Microsoft/Ola one. Grab and Microsoft are also kicking off a strategic partnership that will see the ride-hailer adopting Microsoft’s Azure cloud platform, more here. One Championship, a Singapore-based mixed martial arts (MMA) organization that stages tournaments across the region receives US$166m Series D from Sequoia Capital with Temasek and Greenoaks participating, bringing its total funds raised to US$250 million, more here. Gogoprint raises US$7.7 million in series A led by Online Printing Group to expedite its APAC expansion, more here. BlackBuck, an Indian logistics service raises $27 million from a group led by Sequoia India participated by Accel Partners and Sands Capital, more here. Gobi Partners together with Core Capital launches a US$10 million early-stage fund for the Philippines to invest in themes including B2B e-commerce, platform-as-a-service (PaaS), health tech, and logistics, more here. Tencent stocks hit a new 15-month low. Overall, it has lost up to HK$1.68 trillion ($216 billion) in market value since end-January 2018, after hitting an initial peak. This lost amount matches the entire market capitalisation of Intel, more here. China’s week-long holiday saw Alipay’s transaction value more than double from last year. Overseas spending on the app also grew significantly, more here. China’s Deep Intelligent Pharma raised US$15 million in a Sequoia China-led Series B financing round. The firm operates an AI and blockchain-driven platform for pharmacy companies, more here. Razer CEO talks about the key difference between Razer and the other eSports players out there. The company places a huge emphasis on the gamers, watch it on Youtube. Russia is seeing more and more Chinese smartphone brands in the country. It has reached a new record high of more than 40% of Russia’s smartphone market last month, and this reflects a growing trend that Chinese brands are exerting their influence beyond the shores of China as their domestic market becomes increasingly saturated, more here. Chinese community group buying company Koala Select (考啦精选) raises RMB 30 million in its Pre-A Series Financing round. The proceeds will be used for adding more warehouses and aggressive advertising initiatives, more here (link in Chinese). Bullet Messenger is no longer available on the iOS App Store, barely less than two months after its launch. The firm has told other Chinese media outlets that it is undergoing a ‘’review process’’ before it relaunches again, more here. Mobike sues Didi over patent infringements. It is seeking up to RMB 8 million in compensation. No court decision has been made as yet, more here. 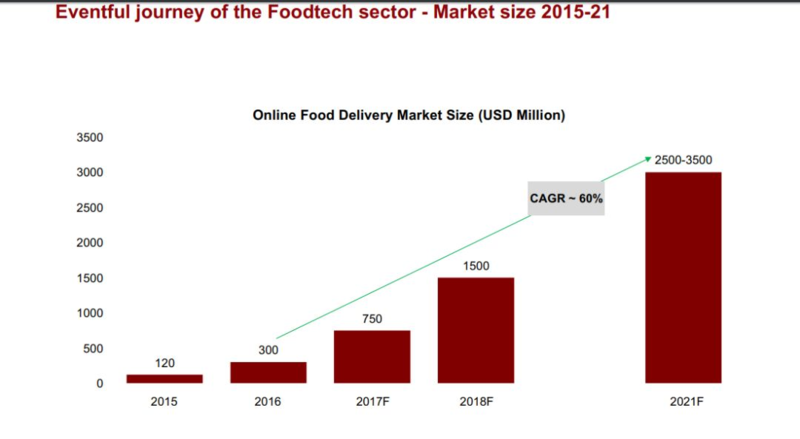 Indian food tech sector growth. Source: TMTPost. Indian Udaan co-founder Sujeet Kumar talks about the road behind building up a unicorn in 26 months – 8 years of grit and hard work, reads more here. In response to Indian central bank’s requirement that all payment-related data should be stored locally and only in the country within six months, WhatsApp builds a system to comply, more here. China’s Ministry of Industry and Information Technology looks to facilitate and deepen the integration between blockchain technologies and the real economies, the agency calls for more research into the areas and more support for blockchain startups and innovations. more here (link in Chinese). This Survey of 1,300 Harvard Business School Alumni Reveals the 5 Skills You Need to Succeed as an Entrepreneur, including 1) identification of opportunities; 2) vision and influence; 3) comfort with uncertainty; 4) building networks; 5) finance and financial mgmt, more here. China, according to a Princeton and Florida International University joint research, with its s dominant position in the Bitcoin ecosystem, political and economic control over domestic activity, and control over its domestic Internet infrastructure, is powerful enough to threaten the security, stability, and viability of Bitcoin.